Local property owners will pay back the second loan over five years with an addition 2 cents per $100 of value, which they have been paying since 2011. Owners along the oceanfront pay an additional 17.5 cents. Original plans were to get started last spring. But the board delayed the project after bids came in well over the $34 million budget for pumping sand onto the beach. Great Lakes Dock and Dredge, which handled the 2011 nourishment project for Nags Head and last year’s work from Duck to Kill Devil Hills, was the low bidder for the new Nags Head project with their proposal of $36,644,500. Bringing the total to $42.7 million are engineering costs, a contingency fund, ocean outfall work, turtle monitoring, beach profile monitoring, sand fencing and other fees. Besides the bond money, $9.57 million will come from the Dare County Beach Nourishment Fund and $5.4 million from the town’s capital reserve fund. About 4 million cubic yards of sand will be pumped by dredges from offshore borrow areas. Bulldozers on the beach will spread the sand around and the ocean will do the rest. Up to half the visible sand will slide into the nearshore to create a protective slope, according to coastal engineers. A survey shortly after Hurricane Matthew in October 2016 indicated that the shoreline had lost a third of the sand — 1.43 million cubic yards — from the original project. 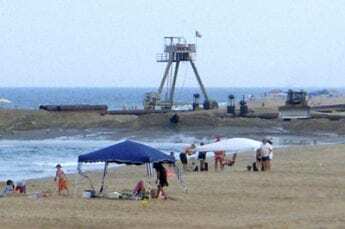 Town officials asked FEMA to reimburse Nags Head for the cost of restoring the beach to the contour recorded in a June 2016 survey, when about 90 percent of the sand remained in the system. FEMA considers the beach and nearshore out to a 19-foot depth. @margie asking how long each mile takes: 100-120 days to go 11 miles mean they need about 10 days per mile, but that’s only if things go well and they stay on schedule. Previous OBX beach nourishment projects have taken longer than estimated because delays due to high waves, high wind, and equipment breakdowns have forced work to stop for days at a time. Well needed project especially after the recent delay. But the description of who pays (locally) is a little off. It’s not just the “oceanfront property owners” paying the 17.5 cents per $100 valuation but all those property owners east of NC 12 or 1243 (SOOIR). These roads have no relationship to flood zones or risk of flooding and do not correspond to any FEMA Flood Maps nor do they represent DCM coastal erosion rates. So why use these roads to distinguish who pays 2 cents vs 17.5 cents? Because it’s easy for local government to apply! Right!! How long does each mile.. or so take?